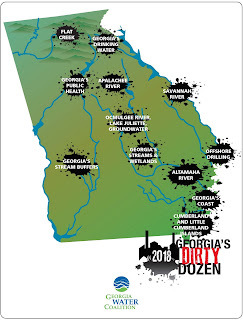 The Georgia Water Coalition’s Dirty Dozen report does not list the most polluted places in Georgia but rather highlights the “politics, policies and issues that threaten the health of Georgia’s water and the well-being of 10 million Georgians,” the news release issued today states. 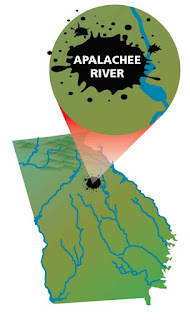 Included on the list in addition to the Apalachee River intake are a chemical spill in March in Dawson county north of Atlanta that killed federally protected Cherokee darters and other fish, Gov. Nathan Deal’s silence on proposed offshore oil drilling, and threats to state rivers from coal ash ponds. 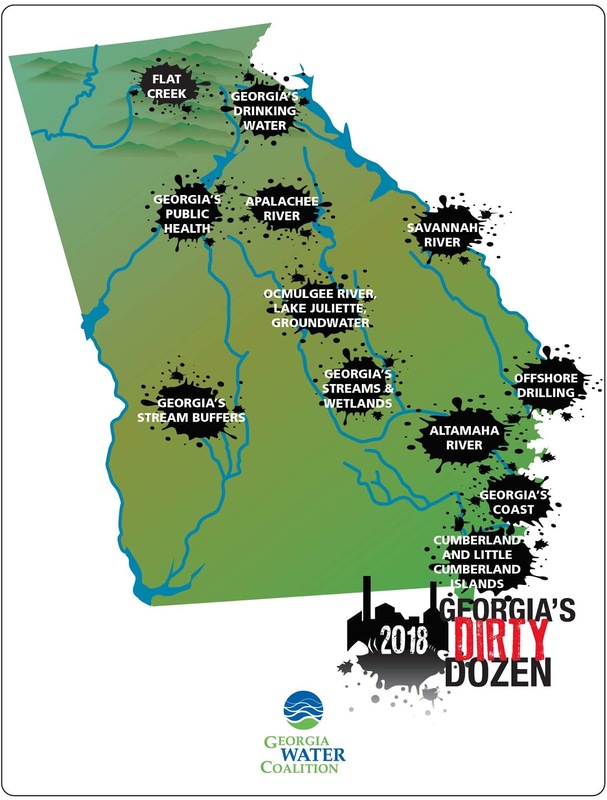 The Water Coalition released its 2018 Dirty Dozen List in a tele-press conference at 10 a.m. today. A representative of the Greater Apalachee River Community was a participant in the tele-press conference. The proposed withdrawal of water from the Apalachee River would take an average 33 million gallons per day from the river at a point where average flows are 126 million gallons per day, the Georgia Water Coalition states in its Dirty Dozen Report. The Walton County Water and Sewer Authority last month agreed to purchase land in Walton County just upstream from where SR 186 crosses the Apalachee River and is seeking renewal of its permits with the Corps of Engineers and the state Environmental Protection Division for its withdrawal of water from the river. The Georgia Water Coalition report notes that the state and federal withdrawal permits were issued in 2004, but the demand for water has changed since that time. “Hard Labor Creek Reservoir now sits brimming with water that nobody needs or is currently using,” the report says. Initial plans for the Hard Labor Creek Regional Reservoir anticipated selling water to meeting Atlanta’s needs. The Metropolitan North Georgia Water District now reports that the water needs of the 15-county metro Atlanta area can be met with already planned water sources—which do not include Hard Labor Creek Reservoir, the Water Coalition report states. Walton County borders but is not part of the North Georgia Water District. The Georgia Water Coalition did not rank the 12 items on its list. “From state leaders deceiving citizens and shortchanging environmental programs in the state budget to powerful corporations using their influence to change state policy at the expense of ordinary citizens, this report is as much about dirty politics as it is dirty water,” Jesse Demonbreun-Chapman, executive director and Riverkeeper with the Coosa River Basin Initiative in Rome, is quoted as saying in the news release issued today. I was invited to but was not able to participate in the tele-press conference today because of a scheduled medical appointment. Friends of Barber Creek, of which I am past president, is a member of the Georgia Water coalition. Amy Lanclos, 1670 Gober Road, in Oconee County, represented the Greater Apalachee River Community in the conference. We need to stop pollution by not having children. Simple, no people, no pollution. The Apalachee River is already a low flowing river with weeks and even months so low one can walk across it. Only in heavy rains does it swell but quickly becomes a small river and a muddy one at that. On an average, if about one fourth of 33 million gallon of the 122 million gallons flow average per day is taken out, there will be little left of a river dividing Oconee and Walton County. As one noted in this article, the need is not even there. Instead Oconee County will relinquish a beautiful but struggling river to the money interest for surrounding areas to their benefit at the expense and health of our own rivers which can never be reclaimed once this intake is built. It makes no sense to waste taxpayer money on a project that may never be needed. Silly!